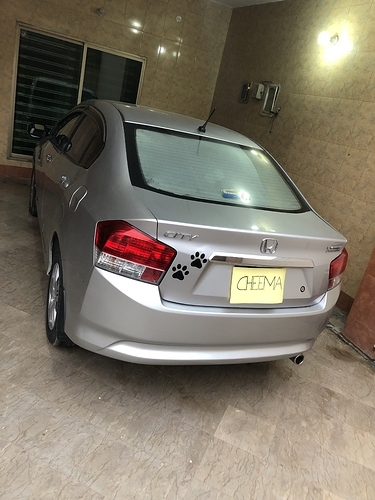 last option will be - give it to me if in Karachi - i will drive it for two years and return you back when you came after 2 years. Change engine oil. Used engine oil has contaminants that could damage the engine. Fill the tank with petrol. Topping it off will prevent moisture from accumulating inside the fuel tank and keep the seals from drying out. You should also purchase a fuel stabilizer such as Sta-bil, to prevent ethanol buildup and protect the engine from gum, varnish and rust. The fuel stabilizer will prevent the fuel from deteriorating for up to 12 months. Don't use parking brake. If the brake pads make contact with the rotors for too long, there is a chance that they might fuse. Use stoppers instead. Consider taking the wheels off and placing the car on jack stands at all four corners. This step requires more work, but it can save you from needing a new set of tires. Your tires will be in much better shape when you return if they haven't been bearing the weight of the vehicle for so long at single spot. if you dnt want then anyone from your friends at least drive it 2 to 6 kms wid in every 10 to 15 days. Sell the car, People living in Pakistan cannot maintain cars in different cities, 2 year in another country is a different story. Buy something when ever you return. Best option is to sell the car. Second Best is already mentioned by @Nabs. I leave my car on axle stands, fluids drained. Inside garage with battery removed. Spray deisel mixed with oil and wd40 on moving parts. When I go back after 1 to 3 years. I replace fuel pipes. wd40 anything that moves. Turn the engine by hand. Fill fluids. Change oil. Fill tyres. And start the car. Cloth cover keeps it clean. My car does not depreciate. It's a Volkswagen air-cooled beetle.